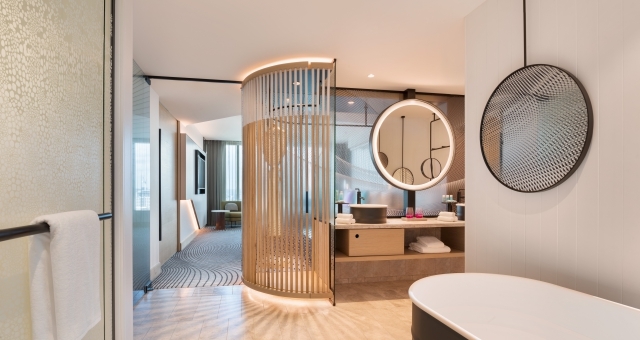 Marriott International‘s popular lifestyle brand W Hotels is re-entering the Australian market today (June 1) with the opening of W Brisbane. W Brisbane is a vibrant addition to sunny South East Queensland in a stellar location overlooking the Brisbane River. The new hotel delivers an intoxicating mix of fast-paced urban style and modern design all with a decidedly cheeky Aussie point of view. With sun-soaked days and electric nights, there’s no better spot than W Brisbane to take in the city’s vibrant culture and rich nightlife. Located riverside in the city’s Central Business District, W Brisbane celebrates the history of the famed region. The hotel embraces Brisbane’s connection to the Australian identity and iconic elements of Queensland’s flora and fauna with a laid-back vibe and a playful nod to ‘Brisvegas’. Renowned Australian interior design agency, Nic Graham and Associates have brought their innovative design and custom furnishings to W Brisbane. 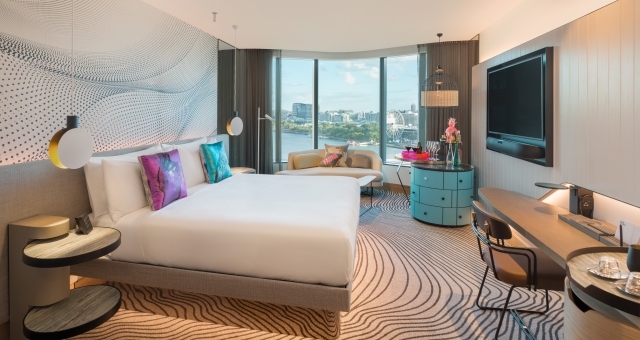 The hotel brings to life the theme of ‘A River Dreaming’, an ode to its prime locale on the banks of the iconic Brisbane River and the visual connection to Brisbane’s famed arts precinct. Modern manifestations of Brisbane’s river, which has in recent years become the buzzing epicentre of the city’s social scene, are featured prominently throughout the hotel, weaving in influences from Australia’s indigenous roots and colonial heritage. From the moment of arrival, guests are greeted by the hotel’s sensory environment. A staircase of timber river reeds leads guests to the Welcome Desk and the Living Room (the W brand’s take on the traditional hotel lobby). These organic formations draw out bold and colorful artwork from celebrated Australian artists including John Nicholson, Lucas Grogan and Reko Rennie. 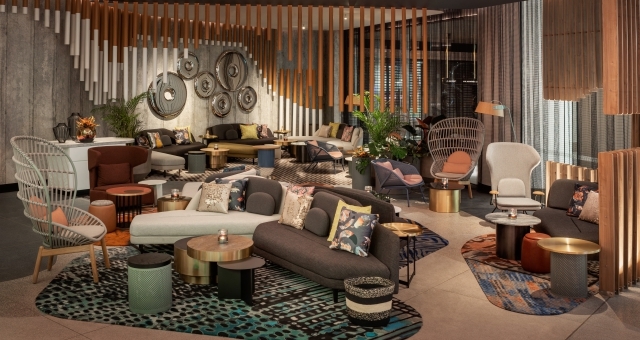 The hotel’s Living Room, the pulse of the W scene in Brisbane, shows off pools of color throughout intricately designed rugs while complementing walls echo the flora and fauna of Brisbane’s sub-tropical environment. Benchtops and bar fronts are enhanced with forms inspired by curvilinear shapes and nearby water-worn clifftops. Blade grass border the expansive open space to immerse guests in an innovative interpretation of nature. W Brisbane boasts 312 guestrooms including 32 lux suites all brimming with river views and the latest in technology and entertainment. The rooms prominently feature a white wall inspired by VJ wall panels found on traditional ‘Queenslander’ homes; a cheeky nod to Australiana throughout and a 10-gallon drum ‘outback bath experience’. The penultimate Extreme Wow Suite (the brand’s modern interpretation of the traditional presidential suite) on Level 33 showcases a limitless panoramic vista from the river to the mountains and beyond. 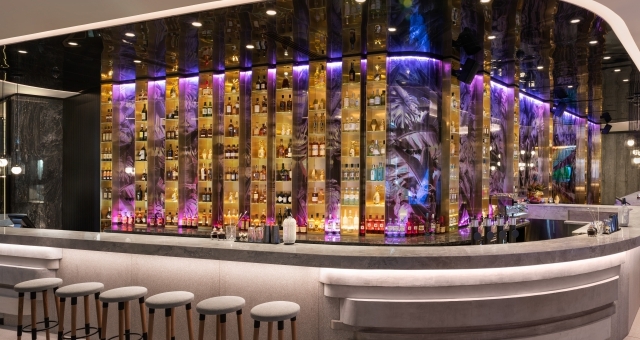 W Brisbane showcases three distinct venues to tempt the appetite for cocktails and cuisine. Three Blue Ducks, W Brisbane’s signature restaurant and a first for Queensland, mixes Brisbane’s vibrant yet laidback culture with The Ducks legendary paddock to plate ethos. Guests can expect a fresh and seasonal menu, infusing home-grown inspiration into every dish. Living Room Bar evolves from a serene daytime lounge to a glam cocktail bar by night where guests can savour sips from the Liquid Curator who will be mixing up an array of handcrafted cocktails every night of the week. Guests can make a splash poolside at the Wet Deck rooftop bar as they soak up the heat on stylish sun lounges. The pool’s sparkling surface reflects a mosaic of tiles reminiscent of the shadows cast by palm fronds. Day or night, guests can revel in Queensland’s supreme riverside views with curated cocktails, Champagne, live DJs and Aussie barbeque fare. At W Brisbane, 1,100-square-metres of event space set the stage for electric and exhilarating meetings and events. The 595-square-meter Great Room captivates on a grand scale as the sprawling venue celebrates the serpentine shape of the river and its ripple effect throughout the design. The ceiling sparkles with 260 twinkling lights reminiscent of a clear Queensland outback starry night. Cutting edge statement lighting and four-metre LED wall panels will help guests showcase captivating presentations and displays and W Brisbane stands as the sole hotel in Queensland to boast these world-class audio-visual facilities. Additional meeting rooms include the versatile Studios and Strategy Room that showcase fab river views and glorious Queensland sunshine with floor to ceiling windows and private balconies. Guests can detox, de-stress and rejuvenate the body, mind and soul at Away Spa, featuring a sublime treatment menu of Sodashi and Skeyndor facials and massages in addition to perfectly pampering beauty treatments. Away offers an escape from the outside world with vitality pools, relaxation pods, ‘His and Hers’ salt inhalation chambers and aromatherapy steam rooms to enhance the spa experience. Away Spa will be home to Edwards And Co. hair salon with the style-centric hair haven making their Brisbane debut. Those wanting to take it up a notch can sweat it out at the hotel’s state-of-the-art FIT gym complete with Technogym equipment and resident Personal Trainers.